1.1 This Standard Practice applies to small valves and manifold valves developed for and predominately used in instrument, control, and sampling piping systems. It covers steel and alloy valves of nominal pipe size (NPS) 2 and smaller, and pressure ratings of 15,000 psi (103.4MPa) and lower at 100 ° F (38° C). 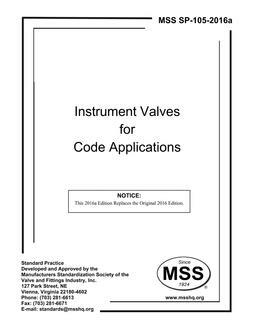 See MSS SP-99 for instrument valves not involving code applications. 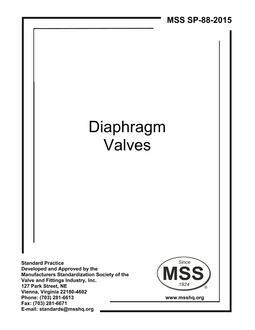 1.2 This Standard Practice applies to instrument valve designs including, but not limited to, needle valves, packless valves, ball valves, plug valves, check valves, and manifold valves. Instrument valves are generally of proprietary design. This Standard Practice is not intended to define or limit designs, construction, performance, envelope dimensions, or valve types. 1.3 The application of valve type, size, rating, materials of construction, and suitability for the service are the responsibility of the purchaser and are outside the scope of this Standard Practice.